Zimbabwe Villagers Displaced by Diamond Mining Seek Government Help. More than 1,000 families were moved from their village in 2009. MUTARE, Zimbabwe—Villagers relocated to a sprawling government-owned farm complex in eastern Zimbabwe to make way for the nation’s biggest diamond field are hoping that President Robert Mugabe’s move to take control of the valued resource will benefit them. More than 1,000 families were moved in 2009 from a village adjacent to the Chiadzwa diamond field in Marange to Arda Transau, a 12,000 hectare farm settlement about 40km to the north with promises of a better life. Arda Transau was billed as a new township with tarred roads, shops and health clinics — but seven years later the villagers say they have yet to see the promised education and health facilities while their homes are crumbling and food is scarce. Seven mining companies licensed to mine the area were ordered in March to leave by Mugabe who accused them of robbing Zimbabwe of wealth. Mugabe took over all diamond operations in the newly formed Zimbabwe Consolidation Diamond Company (ZCDC). Some of the affected diamond companies — Mbada Diamonds and Anjin Investments — have since taken the government to court with the issue still pending before the courts. While Mugabe’s move could further tarnish the country’s image as a risky investment, with investors already unnerved by his drive to force foreign-owned firms to sell majority shares to locals, the relocated villagers are hoping it will help them. Caiphas Mujuru is one of the Arda Transau residents lobbying the government to get ZCDC to address the problems faced by the villagers who are facing severe food shortages. “Life is really difficult here at Arda Transau. We are going hungry,” Mujuru told the Thomson Reuters Foundation. DROUGHT AND HUNGER When the villagers were moved, each family was given $1,000 in compensation and a four-room house but these new dwellings, painted bright yellow, have since developed cracks. Families were promised 11 hectares of arable land including one hectare earmarked for irrigation to run small piggery or poultry projects but this never happened, the villagers say. People in Marange hoped the diamond industry would pump money into reviving failing irrigation schemes as small-scale farmers cannot maintain or replace ageing equipment and national law requires mining companies to help local communities develop. But the plight of the villagers has been further exacerbated by the current El Nino induced drought which has decimated the southern African nation’s crops, leaving 4 million Zimbabweans in a population of 14 million without adequate food supplies. The villagers had the chance to voice their concerns at the Alternative Mining Indaba conference in Mutare this month comprising civic society, communities and stakeholders in the mining sector and legislators promised to help. “We will take your concerns to the Minister of Mines (Walter Chidhakwa),” Prosper Mutseyami, legislator for Musikavanhu constituency in Chipinge district, told the villagers. However the diamond companies maintain they fulfilled what they were expected to do for the relocated villagers. Anjin Investments, which was a joint venture between the government and Chinese investors, said it complied with the law when it came to the relocation of the villagers. “We did everything required by the law,” Anjin Investments’ Chief Executive Officer Munyaradzi Machacha told the Thomson Reuters Foundation in a telephone interview. A spokesman for Mbada Diamonds, George Manyaya, said his company was happy with what they had done for the villagers and the traditional leaders had appreciated their initiatives. But villager Blessing Mufute said the situation at Arda Transau had become so bad that many people were going hungry. “We have been selling the few livestock we had to buy food,” said Mufute, adding relocated villagers were in urgent need of jobs, clean water, and electricity as well as food. In a telephone interview with the Thomson Reuters Foundation, Mines Minister Walter Chidhakwa said local people should not feel they are forgotten. He said the Manicaland Provincial Affairs Minister Mandi Chimene would work with the Ministry of Labour and Social Welfare to provide social and food assistance to the villagers. Contractors would also be asked to work on the poorly built houses at Arda Transau, Chidhakwa added. But James Mupfumi, who heads the Centre for Research and Development, a local non-governmental investigative organisation, is sceptical. “It is disheartening to realise that the Mines Minister has already visited Arda Transau for Zimbabwe Consolidated Diamond Company to relocate more villagers to Arda Transau without addressing previous community grievances,” he said. 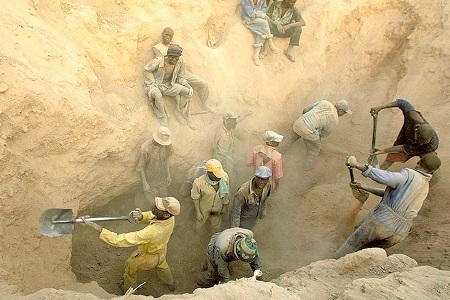 Photo: Miners toil as they dig for diamonds at Marange, eastern Zimbabwe. About 12,000 hectares of farm settlement was cleared for the mining company. Source: AP.